Originally posted July 20 2008 at 17:07 under General and Friends and Moments. 2 Comments. Trackbacks Disabled. It seems to take me about a week to manage to write about anything at the moment; anything substantial anyway. Ah well, such is life. So this is about last weekend. Seems so long ago, and just like yesterday. I had travelled north, mainly because it was far too long since I’d seen Janet. And given the engineering works going on Sunday (because no-one might want to get into London from the north on a Sunday evening, right?) At least the train up ran pretty smoothly, even if some people don’t have the sense to realise that the 19:00 north out of Kings Cross on a Friday (probably the busiest East Coast train of the week) is probably not the best train on which to take children, especially restless children guaranteed to get bored. It was worth it simply to get to lie down next to my girl again, even if she did make me go out too early the next morning because she’d forgotten her makeup! Somewhere on Saturday we’d decided it would be nice to go out Sunday on a trip to Beamish, the open air museum. So Sunday found Janet and I wandering to find the right bus (how did people manage before the internet made finding this out so easy?) and a convoluted lost journey later brought us to the gates of times gone by. We’d both been before (I think everyone from around those parts has) but not for many years, so it was nice to wander round, hopping on and off the trams (just like Croydon!) and poking our noses into the past. Starting out in the pit village with some impressive steam driven machinery, and a baking demonstration where to the great frustration of everyone they can’t sell or give away the produce (why we ask you, why?) Onwards to the town, the best known part of Beamish with all the period shops. We did decide they could do with another pub though, the Sun Inn tends to get a little over crowded being the only venue. Not as crowded as the sweet shop, though the trick there seems to be to wait until nearer closing time. It’s always nice to see good old Ravensworth Terrace too. I’ve mentioned that in passing before. 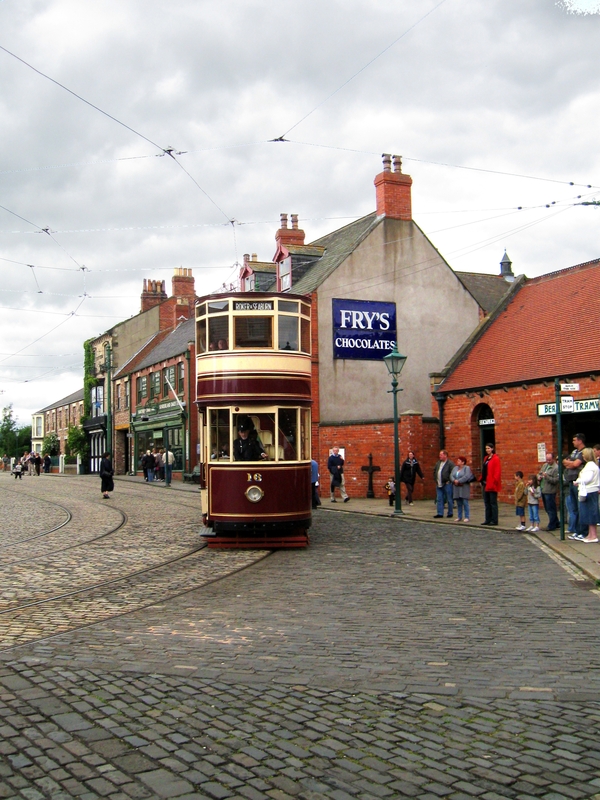 Probably the thing which almost amazes me most about Beamish is that they’ve moved not just little things but entire buildings and streets! Just down the road from the town is the station and across to the fair. Janet couldn’t convince me to go on anything (yes, I’m boring) but seemed to enjoy the carousel (there are photos of that but they’re being withheld for the obvious blackmail potential). After all that we decided there wasn’t really time left to see the rest—definitely need a full day to see everything—so caught Captain Cream Cake’s tram back to the entrance. There we wandered round and round the gift shop about five times, but they definitely have no penguins. Monday Janet had a dentist appointment which seemed to manage to eat most of the day, until it was time, too early as always, to return south. Never easy parting but a nice weekend. See you soon pixie! That was indeed the impression we got. The thing is, the consensus of those around was that they used to be able to supply it but can’t anymore, so I suppose something may have changed in the meantime. We would have all happily signed whatever disclaimers necessary to say we accepted the risk, on the basis that eating a bit of bread baked in a traditional manner in an obviously well kept kitchen wasn’t that likely to kill us. Wasn’t just bread either, cake, scones, such a waste!